MANILA - Celebrity couple Nadine Lustre and James Reid went on a trip to celebrate their third anniversary as a couple. The two took to social media to share snippets of their getaway. Lustre posted a photos of herself and Reid enjoying a meal in an undisclosed location. Screenshot of Nadine Lustre's Instagram Stories. Reid also shared a photo on his personal Instagram account. 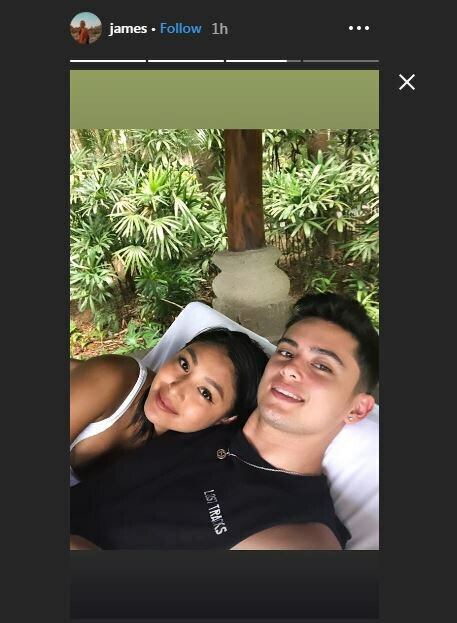 Screenshot of James Reid's Instagram Stories. Lustre and Reid became a couple on February 11, 2016. They first announced their relationship during their "JaDine In Love" concert.